Disclosure. It’s a touchy subject especially when you have an “invisible injury,” such as a Traumatic Brain Injury. Yes, it can be easier to disclose your injury to friends and family as opposed to an employer or co-workers, but disclosure can work to your benefit in a work environment and at home. 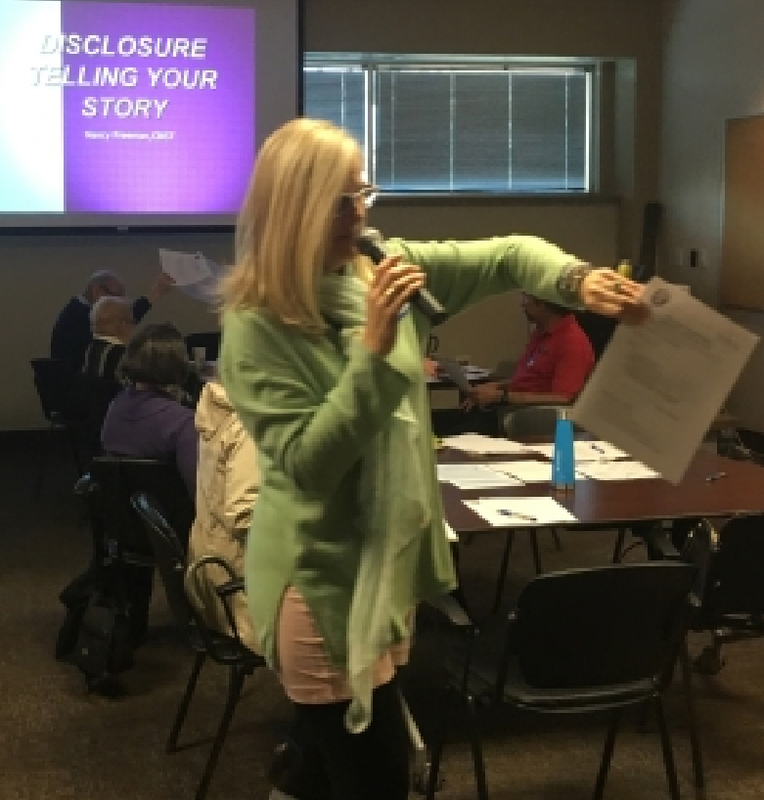 Nancy Freeman, a Certified Brain Injury Specialist Trainer, presented the topic deftly with humor and breakout groups during the third session of the Brain Injury Survivor Series free (grant-sponsored by Spalding Hospital Volunteer Association) luncheon March 9th, 2018. The series was presented by the Brain Injury Hope Foundation at Rocky Mountain Human Services in Denver. One of the first things a survivor of a TBI must do is create the story you tell yourself and you tell others. Take the time to decide what your story is and make it positive. In telling your story you have control by deciding what you want to divulge and writing down your story will help you be clear. And remember you only need a few sentences. You don’t need to tell your whole story. An example of this: I’m recovering from a concussion. I’m better than what I was and I’m getting better every day. One of the cognitive tests I took revealed that I was “wicked smart.” So I’m able to handle my life. To support and empower others. To let family and friends know why I may get fatigue. That it’s OK to talk about. Employment is a trickier road to travel. Some say don’t disclose, other say “coming out of the closet” was the best thing they did when they disclosed their TBI to their employer or potential employer. This is an area where people want a black and white answer and it is really “gray”—depends on you, your situation, your willingness to take a risk, your choice to only want to work for an organization that you CAN disclose to, etc. Freeman said you have to be comfortable and to look at the essential functions of the job. Can you do the job? See how the company responds to others with disabilities. Do you want to work for a company that will not accommodate you? And in the current job market where unemployment is low, people with disabilities can be empowered.